A generalized extreme value continuous random variable. As an instance of the rv_continuous class, genextreme object inherits from it a collection of generic methods (see below for the full list), and completes them with details specific for this particular distribution. Note that several sources and software packages use the opposite convention for the sign of the shape parameter c.
genextreme takes c as a shape parameter. The probability density above is defined in the “standardized” form. To shift and/or scale the distribution use the loc and scale parameters. 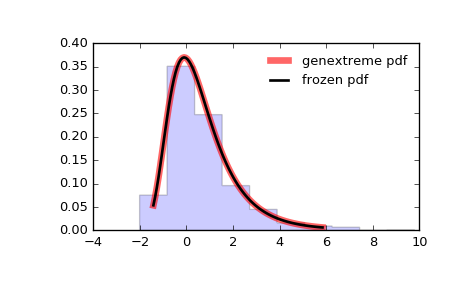 Specifically, genextreme.pdf(x, c, loc, scale) is identically equivalent to genextreme.pdf(y, c) / scale with y = (x - loc) / scale.